So many of the people Lifting Generations works with already have the entrepreneurial spirit, and own and operate family businesses, or are searching for a job. Sometimes, though, it takes a little more to help the good, hardworking people we serve. Take for example the Molina Potoy family. When this husband and wife enrolled in the Lifting Generations program, they had no savings and only a very meager income of $90 per month – nowhere near enough to begin the process of breaking the cycle of poverty. The family wanted to start a business, but didn’t have the skills, equipment, the training or the money they needed to reach their goals. That’s when we stepped in to help. We were able to make a difference to this family by offering self-employment and business training courses to teach them the skills they would need to start a business. But we didn’t stop there. 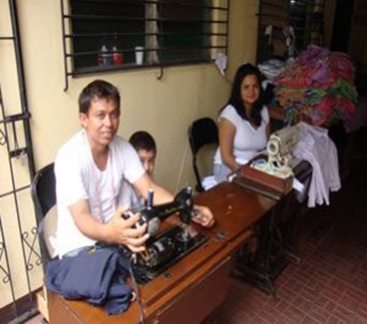 We also provided a micro-loan to help the family purchase the two sewing machines they needed to open a tailoring shop. We’re so pleased to report that, as a result, all of their hard work has paid off! The family business has been amazingly successful, and is now so profitable that the family has been able to earn an average of $795 per month – an amount almost nine times what they were making before! In addition, they’ve been able to earn enough money to send their children to school, and for the wife to study a new career at a local university. The Molina Potoy family has experienced such a tremendous amount of success, that they wanted to share this testimonial with us and anyone interested in learning more about what we do. In addition, the family has paid back in full the micro-loan amount they borrowed from Lifting Generations to start their business. We’re pleased to report that this money was well used: first as an investment that has so richly benefited the family, and will now be used to help others. We invite you to learn more about how you can help us to invest in the future of more good people such as the Molina Potoy family – and how it will pay off to help end generational poverty!